This article presents findings from my Master’s thesis work on nursing students experiences of their mental health practicums. My clinical background is in mental health nursing, and I previously worked as a Clinical Instructor supporting students through their mandatory mental health practicum in a general nursing program. Through this experience, I observed how many students struggled with many of the particular challenges this practicum: fear of violence, worrying about being unable to make a difference, and navigating new systems such as locked doors and seclusion rooms. Yet as much as students expressed difficulty in navigating these challenges, they also demonstrated a deep commitment to their patients’ safety and well-being. 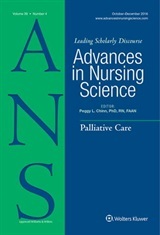 In my Master’s degree, I began to examine the evidence on mental health practicums in nursing programs and found a small yet powerful body of literature illustrating that students in mental health practicums across many countries experience the types of challenges I had observed in my educator role. I also found that these experiences that students were having in their practicums negatively impacted students’ overall preparedness to work with individuals experiencing mental health challenges. Supporting students in navigating difficult mental health placements is a gap in our nursing education programs, and extends to gaps in mental health care delivery. To date, there have been relatively few qualitative studies that have contributed nuance and depth to our understandings of how students experience these practicums and navigate these challenges that have been illuminated largely through quantitative and survey-based research. I hope that this article can support nursing educators like myself in supporting students through the challenges of the mental health practicum, and can inspire nurses and nursing managers to shift practices in the mental health inpatient setting that are difficult for students and, importantly, patients. I also hope that thinking about mental health practicums as a space where resistance to power is possible can give students a new language and perspective on navigating complex environments and challenging experiences in the mental health practicum. I believe when students feel empowered and supported, they can demonstrate compassion, engagement, and commitment, and make an incredible difference in the experiences of their patients. Throughout the process of my Master’s research, I was supported by my committee: Vicky Bungay, Emily Jenkins, and Helen Brown. Each of them has contributed immeasurably to the research and to this article.